The new MuscleBlaze® Whey Protein in Banana Cream flavor is crafted to savor your taste buds while you stick to your bodybuilding regime. Breaking the monotony, the new Whey Protein is back with the same power and enhanced formulation. 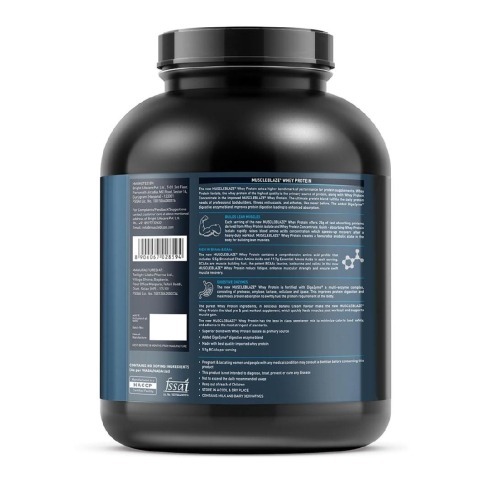 With Whey Protein Isolate and Whey Protein Concentrate as the main sources of protein in this sports supplement, it shows quick results with faster protein absorption rate. Whey Protein Isolate being the primary source makes it a quick absorbing protein product. MuscleBlaze® Whey Protein in Banana Cream flavor comes with pure protein with whey isolate as primary source along with whey concentrate. It helps to deliver 25g of high-quality protein per serving (33g) gain lean muscles and support in immediate recovery after strenuous workouts. Packed with 5.51g of Branched Chain Amino Acids and 11.75g of Essential Amino Acids in each serving, MuscleBlaze® Whey Protein Banana Cream comes with a comprehensive amino acid profile to fuel muscle building. 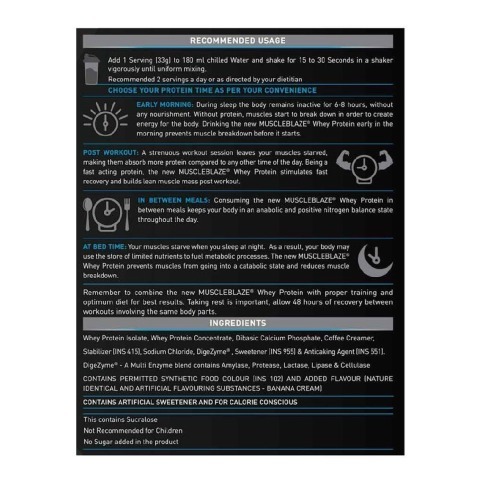 Leucine, isoleucine, and valine assists to reduce fatigue and ensure rapid muscle recovery. Whey Protein from MuscleBlaze® comes added with DigeZyme®, a multi-enzyme blend that aids in the enhancement of protein digestion and delivers maximum nutrients. This supplement gets absorbed easily that aids in rapid recovery and greater muscle synthesis. It does not contain any added sugar and aspartame and minimizes calorie load safely. This supplement even adheres to the most stringent of standards. Add 1 serving (33g) to 180-240ml of cold water or skimmed milk. Blend for 45-60 seconds for a thick and creamy shake. Take 1-2 protein shakes per day or as directed by your nutritionist. There is no universal answer to this particular question since everybody's protein needs vary. Protein requirements vary depending on an individual's age, gender, weight, medical conditions and the nature of the workout one does. The first thing to do is to determine your caloric and macronutrient allotments. After calculating the BMR(Basal Metabolic Rate) and applying the Harris-Benedict Principle, one could know how many calories are needed on a daily basis. 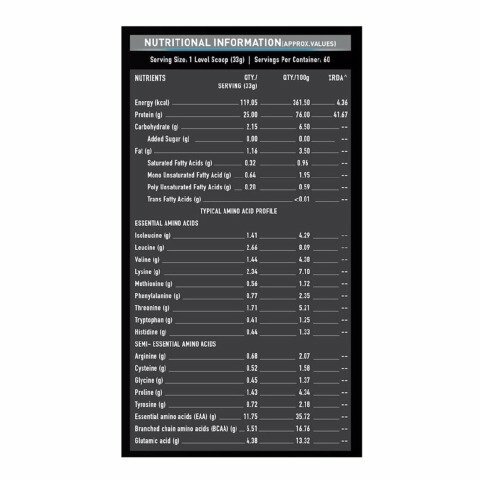 The following table enables the calculation of an individual's recommended daily calorie intake to maintain optimum weight. These side effects can generally be easily alleviated by monitoring your total protein intake and making sure you are aware of any possible food allergies that you may have. If a nominal dose of Whey protein consistently causes stomach or gastro intestineal issues, consider trying a different Whey protein supplement or adding in a digestive enzyme to take along with it. The word ‘whey‘ refers to milk serum which is the liquid by-product produced during the curdling of milk. Whey protein contains 20% of the proteins that are present in animal milk. The other 80% is made up of casein.Whey protein is a mixture of globular proteins that have been isolated from the milk serum during production. Whey protein contains all 9 essential amino acids. Among these amino acids, the BCAAs (Leucine, Isoleucine and Valine) are present in high quantities. The BCAAs account for 35% of the essential amino acids present in the muscle protein and 40% of the preformed amino acids required by mammals. All these combined give Whey protein the highest biological value than any known protein supplement. Concentrate (WPC) : This is produced via ultrafiltration of whey or milk serum. This type of Whey protein is usually 80% protein. The rest of the product consists of lactose (4-8%), fat, minerals, and moisture. Isolates (WPI) : Produced by a variety of membrane filtration techniques with the goal of reaching more than 90% protein concentration and the removal of most lactose constituents, this type of Whey protein is a good protein source for individuals with lactose intolerance as it is devoid of fat and contains little or no lactose. Hydrolysate (WPH) : This type of Whey protein is produced via enzymatic hydrolysis of either WPCs or WPIs. Essentially, this acts as a method of 'pre-digesting‘ the protein by separating peptide bonds; hence the time for digestion and absorption of amino acids will be reduced. Highly-hydrolysed whey may be less allergenic than other forms of whey. 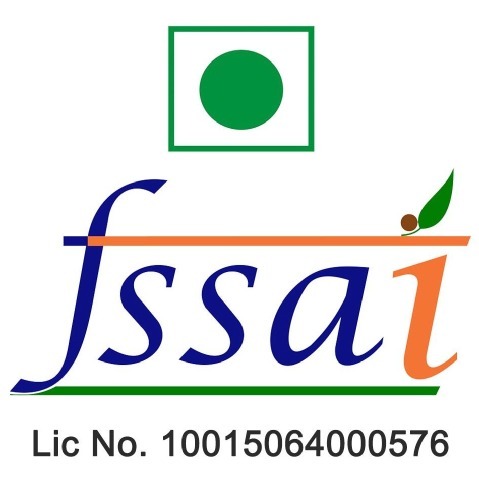 Protein beverages and bars, confectionery and bakery, and other nutritional food products. Protein supplement products, protein beverages, protein bars, and other nutritional food products. Infant formula, sports and medical nutirion products. When milk is treated to cause a shift in its pH value, the casein coagulates and separates. The raw whey is left uncurded on top of the casein. It is then collected and subjected to a list of different processing steps which determine the quality and type of the Whey protein. During filtration, low molecular weight compounds like lactose, minerals and vitamins are removed to make the protein more concentrated. After filtration, the protein is pasteurized, evaporated, and then dried. The drying is done at low temperature to avoid denaturing. Proteins are essential macromolecules and perform a vast array of functions within all living organisms, such as metabolic reactions, replicating DNA, responding to stimuli, transporting molecules from one location to another, energy production, cardiovascular fucntion, immune system fucntions and several others. Proteins differ from one another primarily in their sequence of amino acids. Proteins can thus be thought of as the building blocks of muscle tissue since muscles serve as the richest reservoirs of amino acids in the human body. Whey protein is a complete protein that contains all 9 essential amino acids that help in keeping your body fit. 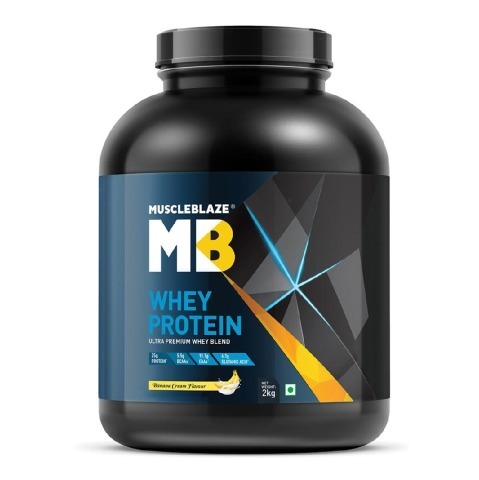 Whey protein is an esaily assimilated assimilated source of high quality protein that stimulates a high rate of protein synthesis and net protein gain in tissues. Directly enhances a number of key aspects of the immune system that protect the body against illness and infection. Promotes high glycogen levels within the liver; an important storage form of energy for any physical exercise. Enables speedy recovery after physical strain or exercise. Provides a source of bioavailable calcium to help maintain bone health, and prevent stress fractures that many athletes experience during training. In some cases, it helps enhance memory performance in elderly adults. Increased protein intake may reduce bone mineral loss that causes fracture in older women. May promote weight loss without decreasing muscle mass in overweight older people. May help to preserve and minimize body protein loss during aging. May improve the GI immunity of infants by increasing levels of beneficial flora. Hydrolyzed Whey protein formula may help reduce the duration of crying in infants with colic. Provides high quality protein for weight loss in surgery patients, both pre-operation and post-operation. Rich source of BCAAs and bioactive components that help increase fat loss and promote lean muscle tissue. More effective than red meat in reducing weight gain and increasing insulin sensitivity. May help patients suffering from cystic fibrosis maintain optimal glutathione levels to help counteract the negative effects of disease related oxidative stress. Improves the antibody response of the intestinal tract. Provides high concentration of BCAAs. Helps enhance humoral response to support immune health. Provides a protective, anti-microbial effect against ulcers and other gastric mucosal injuries. Rich source of bioactive components with anti-microbial and anti-viral properties. 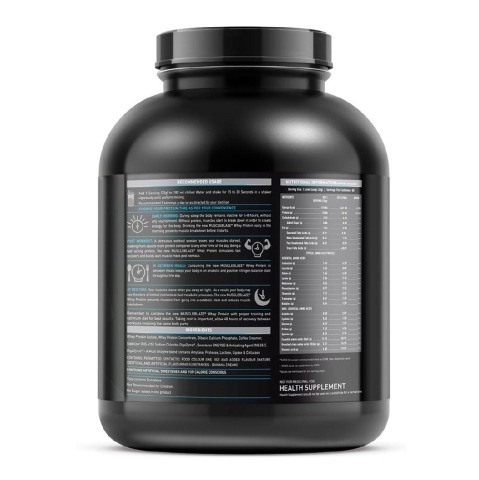 Rapidly digested and efficiently absorbed to help stimulate protein synthesis versus casein. A high quality source of protein that is easily tolerated in individuals with lactose intolerance (WPI). May help improve cardiovascular risk factors: cholesterol (HDL and total), triglycerides, C-reactive protein and hypertension. May reduce blood pressure in individuals with borderline hypertension through the inhibition of ACE (angiotensin converting enzyme). Source of bio-available calcium to promote bone health when combined with other dairy nutrient. Helps maintain adequate glutathione levels for a healthy immune system. May help to support metabolic processes with its ability to bind minerals, fat-soluble vitamins, and lipids. May help to provide a calming effect to individuals during periods of stress (alpha-lactalbumin enriched Whey protein). Choosing the right Whey protein supplement will come down to a few factors that include budget, quality, flavor, lactose tolerability and intended uses. Lactose Intolerance : If you are allergic or hypersensitive to milk, milk products or are lactose intolerant, then you should go for Whey protein Isolate which is devoid of lactose. Whey protein is bland in flavor, making it easy to incorporate into many recipes and food products. Weight Loss : If you are looking to lose weight while maintaining a lean muscle structure, then you should opt for Whey protein Isolates. Vegetarians : Acquiring enough protein is often considered one of the hardest parts of maintaining a healthy vegetarian diet. Proteins are most commonly found in red and white meat. Fish also contains proteins, but the strands of proteins differ from those found in a cow or a chicken. For vegetarians, Whey protein become essential as their protein intake is limited to vegetables only. Others : Body builders, beginners at the gym, marathon trainers, athletes etc., they all need Whey protein. Athletes and bodybuilders usually combine the two, consuming whey for quick protein replenishment and banking on Casein for it's slow and steady protein release, leading to muscle recovery while they are asleep. Yes, Whey protein can be stacked with a number of other supplements like creatine, dextrose, casein and others. But if you are planning to stack other supplements with Whey protein, it is recommended to consult to a doctor or a certified trainer before doing so.